Time and Watches mainly focuses on mechanical watches but, from time to time, we also highlight remarkable non-mechanical timepieces. The just announced Seiko Prospex Radio Sync Solar World Time Chronograph, a Baselworld 2016 preview, is interesting not only for its features and performances but also because it achieves a good aesthetic balance for a tool watch. Conceived with pilots in mind, this new Prospex model gives priority to absolute precision (+/- 1 second every 100,000 years when connected to a radio signal) and reliability (the solar powered quartz calibre will never need a battery change because the energy from the light is stored in a self-recharging battery). The 47.8 mm x x14.5 mm case is proposed in three variations: stainless steel and bracelet (SSG001), stainless steel and bracelet with black hard coating (SSG003), and stainless steel and calf leather strap (SSG005). The new radio wave calibre 8B92 can receive time signals across a much wider geographic area than ever before, delivering greatly enhanced coverage in Europe and China, as well as throughout the USA and Japan. When conditions permit, the time is synchronized automatically, up to three times a day, to the atomic clock signals broadcast in Japan, USA, China and Germany. Of course, this adjustment can also be done manually, at any time and at the press of a single button. 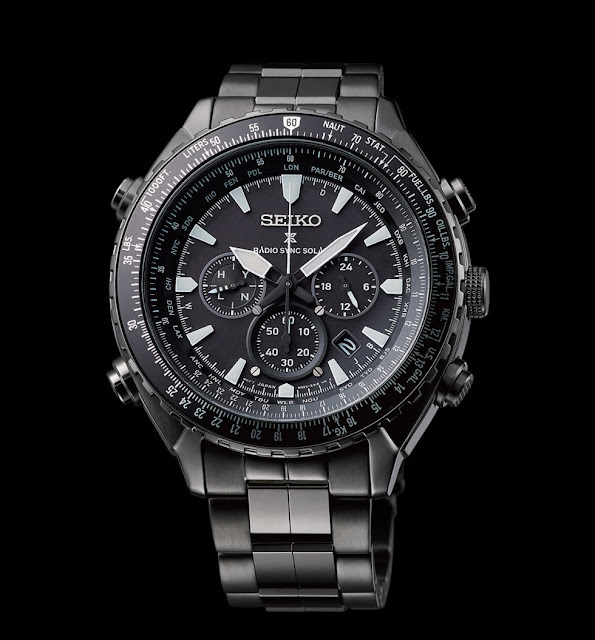 Even when a radio signal is not available, the Seiko Prospex Radio Sync Solar World Time Chronograph guarantees an accuracy of +/- 15 seconds per month. In addition to radio wave precision, the new calibre features a world time function with the display of 25 time zones. 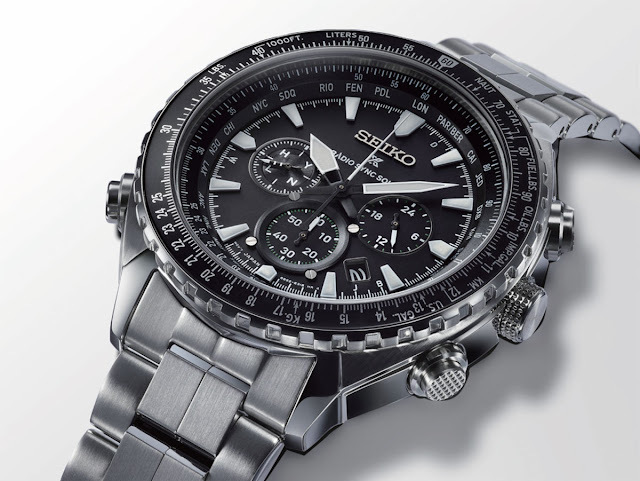 The 24-hour subdial at 3 o'clock shows whether it is day or night in the selected time zone while the date at 4 o'clock is automatically adjusted up to year 2099. The split-seconds chronograph measures intermediate times while continuing to time an ongoing interval up to 60 minutes as recorded in the counter at 6 o'clock. The bezel, designed to be easy to grip, features a slide rule for easy calculations and conversion of distance, fuel load, weight and speed. The top surfaces of the push buttons on the right and left sides of the case are different, thus minimising the risk of pressing the wrong button. Those on the right control the stopwatch while those on the left are for the radio sync and world time functions. The hands and indices are coated with Lumibrite and the Hardlex crystal has an anti-reflective coating for perfect legibility. 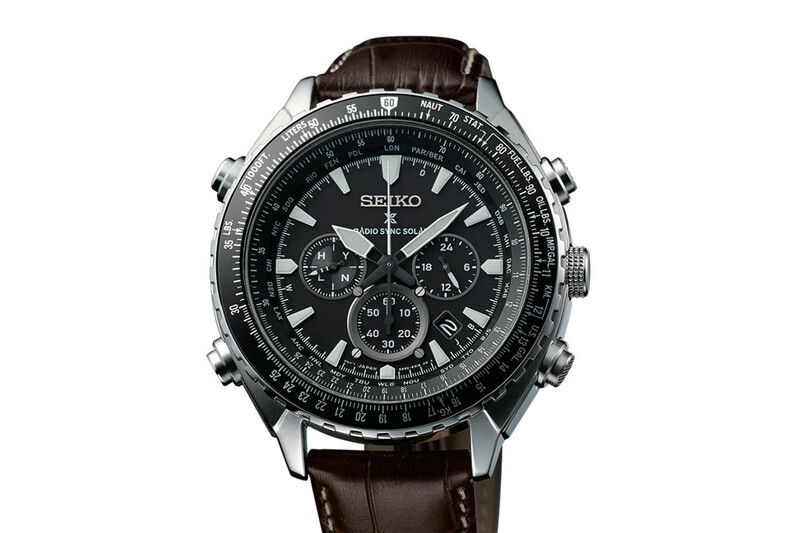 Seiko Prospex Radio Sync Solar World Time Chronograph. Seiko Prospex Radio Sync Solar World Time Chronograph, a Baselworld 2016 preview in three versions: stainless steel and bracelet (SSG001), stainless steel and bracelet with black hard coating (SSG003), and stainless steel and calf leather strap (SSG005). 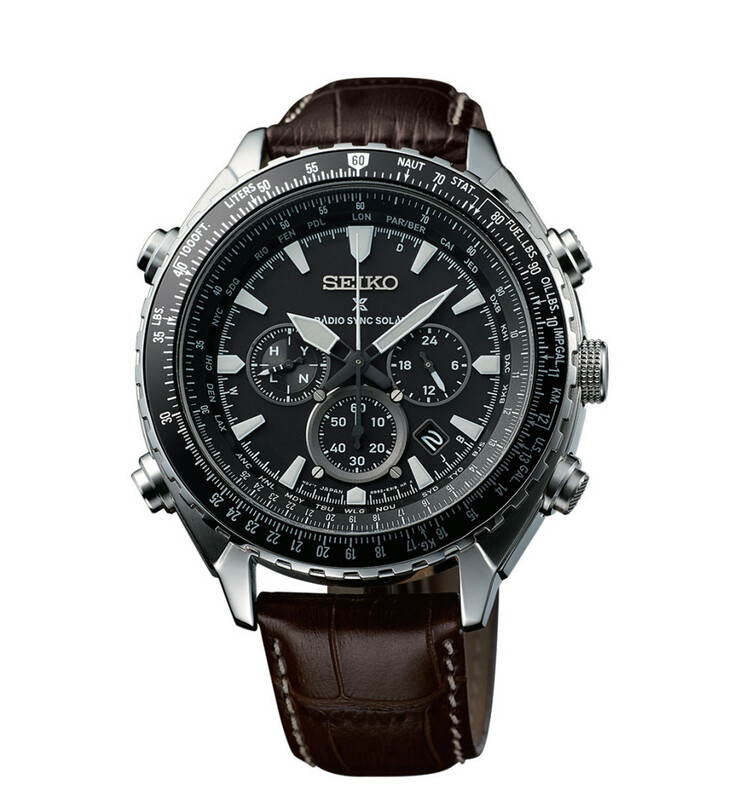 The three new Seiko Prospex Radio Sync Solar World Time Chronograph models are water resistant to 10 bar (100 metres / 330 feet) and will be available in August 2016 with prices ranging from 640 to 730 Euro.